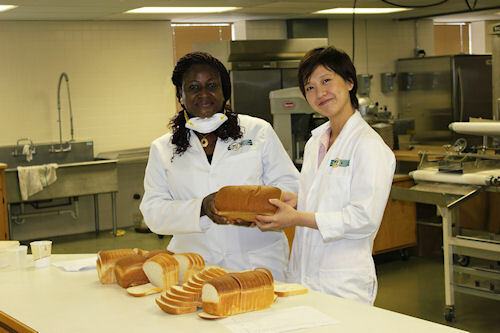 After training at the Northern Crops Institute, Nigerian baker says she plans to use more soy products. Four days in North Dakota gave Margaret Ajufo many reasons and recipes to use in her bakery in Nigera. The North Dakota and Minnesota soybean checkoff organizations supported the World Initiative for Soy in Human Health in bringing Ajufo to the Baking with Soy Short Course offered by Northern Crops Institute in Fargo in July. "I will not be selfish," says Ajufo managing director of Sunset Bakery. "I will help the other bakeries to see the usefulness of soy and that it's really a great product. It's the best quality, best flavor, best color, and has profits from increased yields of our bakery foods." "African food companies and consumers benefit from U.S. soy and the technical expertise that is provided by the WISHH Program," says Jared Hagert, an Emerado, N.D., farmer. He is the immediate past vice chair of the WISHH Program Committee and current treasurer of the North Dakota Soybean Council. "Through WISHH, there is the ability to create commercially sustainable enterprises that focus on utilizing U.S. soy." Ajufo and many other bakers in Nigeria began using defatted soy flour in 2009 as a result of WISHH's work with Alltech, a company in Lagos. WISHH provided Alltech with soy flour samples. The Northern Crop Institute's hands-on demonstrations and technical training gave Ajufo necessary information to make high-quality products with soy. "We also did a lot of cooking with soya; a lot of doughnuts, cakes, it was all really interesting," says Ajufo who plans to add these new products to her bakery in Nigeria. "I was so amazed to see how they made the tortilla. The one with the soya came out very smooth, very nice. I also like the recipe we did for the sponge cake too." Increasing the protein content of food is important for wellness and the strength to work, said Ajufo. "This gives them life…we eat a lot of bread in my country so I'm happy as a producer that I am feeding my people a high-protein product."